Vice-Chair Michael Hogan asked if the board had any corrections for the minutes of February 1, 2018. Bonnie Moroney made a motion to: approve the minutes of February 1, 2018 as written. Brian Mycko second and the motion passed unanimously. Carol Carlson Cunningham sent an email asking for a continuation on her two applications. The board agreed. Brian Mycko asked that the Carlson-Cunningham Site Plan and Subdivision Applications be tabled or continued. Bonnie Moroney seconded and the motion passed unanimously. Will Davis, from Horizons Engineering and representing Carl Brooks, owner of Mt. Deception Campground, was before the Planning Board (PLBD) with a Site Plan Application. Will tell the board that the Brooks� family has owned the campground since the 1960�s and it predates the Zoning Ordinance which was established in 1979. The campground exists as a non-conforming use. So the question before the board is what was in existence in 1979 and what was established after. So they are looking for the PLBD to approve the expansions that took place after 1979. Someone asked if an expansion was part of this Site Plan Application. Carl Brooks said not now but maybe in the future. The board told him he would need to come back to the PLBD if any expansion was to happen. Washington Ski Area and Josh DeBottis, Manager of the Mount Washington Resort. Next the Submission Requirements were read through. (A copy of the Requirements will be attached to the hard copy of minutes in the office.) There were no changes or suggestions for change. 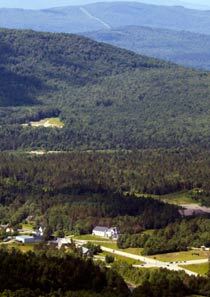 Bonnie Moroney made a motion to: accept the application for Omni Mount Washington Ski Area, Map 211, Lot 14, for the installation of a new gondola base terminal building and new gondola towers and relocation of the Canopy Tour Building. Brian Mycko seconded and the motion passed unanimously. There was a brief discussion again on a joint meeting with Bethlehem. All agreed it would be beneficial for everyone. Richard Krapf made a motion to: adjourn. Bonnie Moroney seconded and the motion passed unanimously. The meeting ended at 9:30 PM.